EFSA Report on AI in the E.U. At the request of the European Commission, The European Food Safety Authority (EFSA) has prepared a review of avian influenza as it has affected the EU. In consecutive years. The following conclusions are contained in the published report dated October 16th, 2017*. Avian influenza viruses, both LP and HP, are introduced into regions by migratory birds. Outbreaks of clinical avian influenza occur in commercial flocks when viruses are introduced into a population of sufficient size to allow amplification and dissemination. Although LPAI can persist in wild bird populations, the propensity for infection of commercial flocks is lower than with HPAI. Clinical signs including mortality are an effective method for early detection of outbreaks of HPAI. Sero-surveillance of commercial flocks is relatively unsuitable for early warning of LPAI outbreaks. Wild bird surveillance has low efficiency for detecting HPAI. The H5 and H7 strains of AI responsible for outbreaks in the E.U. have negligible zoonotic significance. This is in contrast to HPAI strains circulating in Asia including H7N9, H5N6 and H5N1 in addition to H5N1 in Egypt. There is concern in Europe that these strains may be introduced, resulting in human infection and consequential rejection of egg and poultry products by concerned consumers. H5 and H7 LPAI viruses are endemic in the European wild bird population. There is fear that H9N2 of Asiatic lineage may be introduced into the E.U. from Asia, the Middle East or Northern Africa. The EFSA panel identified four geographic flyways by which AI can be introduced into the E.U. Of these, the Northeastern route (E.U. border with Russia) and the Eastern route (E.U. border with Ukraine and Turkey) are the most frequently associated with H5 HPAI. Proximity to wetlands or rivers frequented by migratory waterfowl is a major risk factor for introduction of AI into commercial flocks. 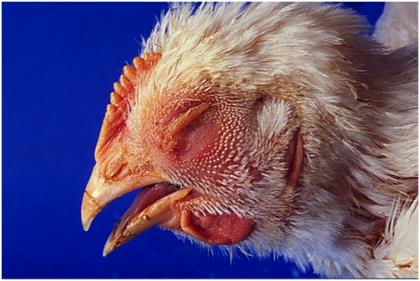 It is estimated that preventing access of poultry to bodies of water results in a three-fold reduction in the probability of an HPAI outbreak. Confining poultry to indoor housing increased the effectiveness of prevention from between 4 to 40-fold, based in the predictive model developed by the EFSA panel. The transmission rate among and between flocks is higher for HPAI than for LPAI strains. Inter-farm dissemination is a function of effective biosecurity and control measures. LPAI mutates to HPAI by spontaneous insertion of genes coding for basic amino acids at the hemagglutinin cleavage site. Recent history has demonstrated a greater propensity for mutation among H7 subtypes than for H5. HPAI is clinically devastating in gallinaceous flocks (chickens and turkeys), but is less severe in anseriforms, (ducks, muscovys and geese). Commercial waterfowl should be separated from commercial chickens and turkeys. The panel concluded that prevention of outbreaks of AI in commercial flocks is dependent on separation of wild birds from poultry. This requires confinement of flocks under conditions of high risk of introduction from migratory birds. Training in biosecurity is necessary to understand, formulate and modify management practices which may predispose to outbreaks. Contrary to established OIE recommendations, there is no scientific evidence to guide the size of control and surveillance zones following outbreaks of HPAI in wild birds. Outbreaks of AI in commercial poultry following identification of the index farm depends on the species affected and the prevailing epizootic factors. Sharing data and expert opinion at national and E.U. levels could lead to harmonization of structured approaches to control and prevention.